Looking For Quality Aviaries For Sale? Not all backyards are created equal and not all birds require the same type of space. Take for instance a larger bird like a Macaw. These majestic birds need some room to move around, but if a full size garden aviary is out of the question, they do very well in a larger custom built aviary. 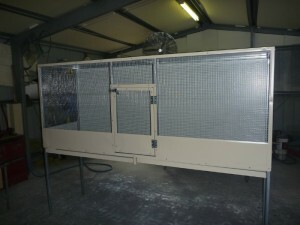 Here is another example of a stock cage which the bird owner wanted to be made larger than the standard size. Please excuse the background as this was taken in the workshop. 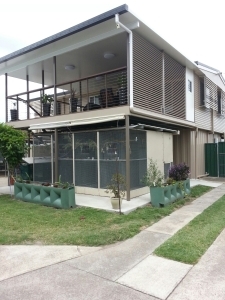 It’s possible, within the constraints of wire and colorbond size, to tailor make your aviary to suit your own requirements. Of course the larger the size, the more difficult transportation will be. Here is a great idea for the summer heat. This aviary has been sized to fit neatly under a house. The birds still get the benefits of being outdoors but are always under shelter and safe from storms. Just ask and Clive will tell you if your design is possible or not. Some may have to be built as a flat pack. He may also suggest an alternate design which may suit you and your birds better. Hi there, I was just enquiring about a pigeon cage. I found a pigeon and need a cage made for it. I plan to put a dove in with the pigeon. So there will only be 2 birds in the cage. Its needs are a little different from that of a normal cage. It needs to have the feeders on the outside of the cage, so it can put its head through the wire to feed. I’m thinking of a size around 1.5 m h,l x d. This is just an idea, as you’re the aviary expert. Please let me know if you could make something like this & an approximate cost. Hi. I’ve been given a 30yr old female cockatoo who has been used to having free run in her former owner’s yard & had a sunroom to herself. When I’m not home, Cockie lives in 100 x 100 x150cm cage, gifted to us with the bird but I would rather have her out in an aviary, preferably something I could move around our acreage occasionally. She likes to dig & pull up weeds, so I was thinking that a wide mesh floor would be suitable, or even floorless. I like the look of your 6 x 4 Alternate Design. How much would it cost to build & deliver to the Gold Coast, please? I am a wildlife carer and I am about to apply for a council grant for a 4 mtre x 2.4 mtr aviary to house lorikeets ready for soft release. Would you be able to send me a written quote? 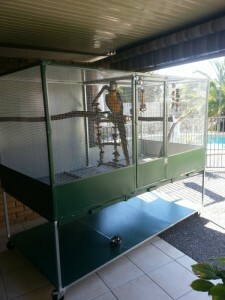 If you have to make it in two modules and then connect it once delivered, thats ok.
Clive , I would like an aviary measurements ,3metres by 1metre with the door in the end,left side end.Would this be possibleand an approximate price.I cant do it till after Xmasbut definately want it. Was just wanting to know how much it would cost for a 1.5m hight, 1.5m width & 1.5m length cage with a door would cost? Ron on Looking For Quality Aviaries For Sale?